I just got home from school, and I feel GREAT! Today was just SPLENDID. Not too normal, but not too crazy either. It basically starts from Math Class, where we had Harmonic Sequences. At first, I wanted to throw my notebook outside the window, but when Miss Toni explained it further, I found out it wasn’t any harder than the Arithmetic Sequences. As it was like most other Fridays, there was an assignment she left with us. It would have been alright, if one of my classmates wasn’t stupid enough to remark on how short our assignment is in front of our teacher. So it happened that Miss Toni decided to add two more HARD items to our assignment. Great. Everything else was normal, other than the insanely easy essay test for History class. I mean, a 5 item essay test? Each question worth 10 points? What could possibly go wrong? NOTHING! I mean, it would be impressive if someone still manages to fail that one. I, for that matter, DOES NOT LISTEN TO OUR HISTORY TEACHER. But then again, the essay only requires your common sense. And I think I have enough of that stuff. At last, it came to the last class we were attending for the week. Music. All we really had to do was to do two practical tests, and we were free to do whatever else we wanted to. The first test was to sing the Japanese song “Looking for Father”, and the easier of the two, clap a short set of notes with your palms. That aside, I went home. Unseen Letters – Halloween in March Contest! Well, good luck to me, I’ll be entering both contests! Haha, forgive me for posting 5 seconds after the last one, I really couldn’t help it. After posting that, I hopped off the chair and dug in my supplies closet, hoping to find a blank sketch/drawing book. And I did! 😀 It’s a Best Buy 9″x12″ with 20 sheets inside, so I’m good with this one. 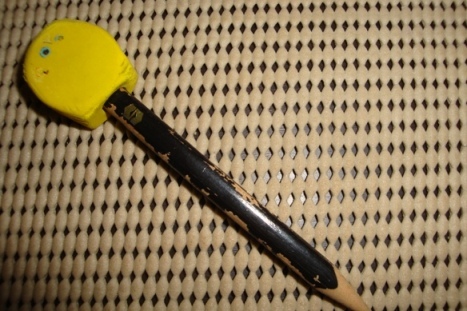 Picking it up, I pulled out my trusty pencil, Doodlebob! Well, anyways, this is how I look like in the morning. My hair is naturally unruly, but in the morning, it’s like I got hit by lightning. It sticks out in all directions, I drew it tamer than it really is in reality. 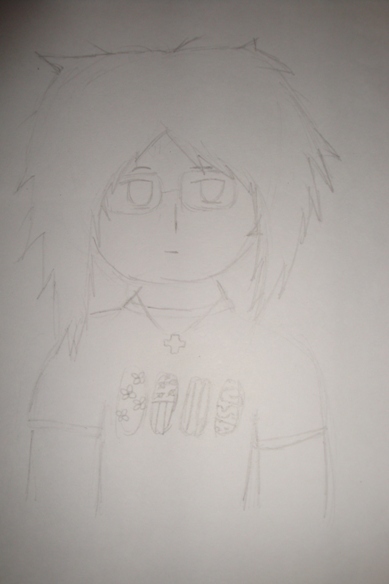 And this drawing also shows my real hairstyle, and that my hair is really that thick. When it’s completely dry, it’s very fluffeh. That’s my eyes riight there. And those lines underneath are eyebags. At the time that I sleep everyday, it’s practically impossible that I lose them anytime soon. And those are my glasses, I always draw them as if they’re floating. And I added the cross I got yesterday. =3 I was bored, okay? And by now you should have noticed that when I draw, there’s no basic difference between a boy and a girl. Watch out for the next drawing, Day 2 – Favorite Animal!